I am very proud to have two of my fine art photography projects included in the groundbreaking exhibition The Sexuality Spectrum at the Hebrew Union College – JIR Museum in New York City. Enter into Faust’s Study, a trompe l’oeil painted room, and be confronted by a fearless man who is empowered and transformed by the duality of his sexuality. His starkly lit, painted face and figure emerging from the shadows are a tantalizing contrast to the painted Adam and Eve on the rear wall. Faust’s Study directs the viewer’s attention to the relationship between the interior details and the subject, suggesting a narrative in which the gender performance artist, Frédéric Koenig, who can so naturally appear both handsome and beautiful, dares the viewer to cross over boundaries of imagination and desire. Faust’s Study, like much of my gender imagery, blurs the traditional definitions of maleness and femaleness. 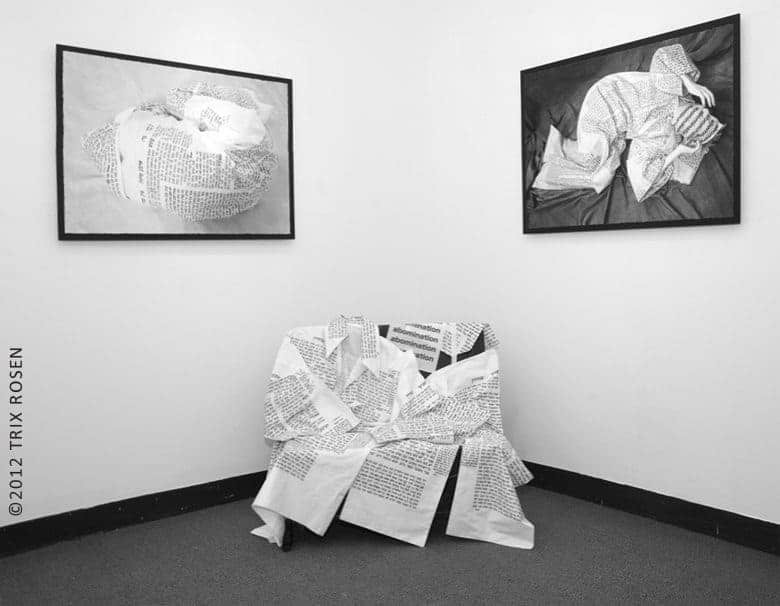 ABOMINATION: WRESTLING WITH LEVITICUS 18:22 is my first artistic collaboration with Susan Kaplow. Our installation explores the damage done by this biblical passage (“Thou shalt not lie with mankind as with womankind: it is abomination”) and its homophobic legacy. The first to wrestle with the meaning of this verse were the early Rabbis and so the chosen text here is the Talmud page where their commentary is recorded. Because this abhorrence of her lesbian sexuality made Susan feel “dead,” she had the Talmud text printed on fabric like that used in the traditional Jewish burial ritual and then hand-sewed it into shrouds (tachrichim). Susan asked me if I would photograph her in these shrouds and, together, we began the process of exploring the physical and emotional dynamics of being enclosed in the garments. We came to realize that the images represented our own commentary on the text, reflecting the impact on those who suffer this curse. 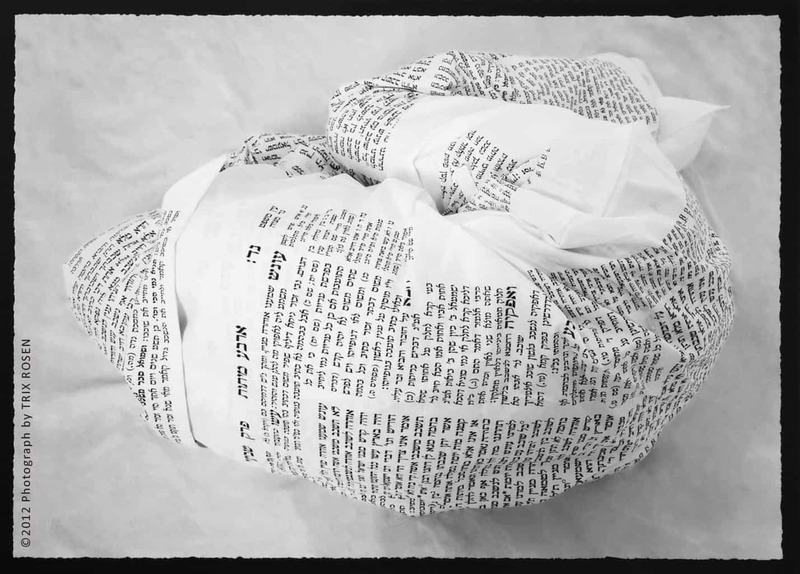 Through the constitutive role of photography, we transformed and transcended the pain, ultimately retiring the shrouds to a geniza, in which sacred texts and objects which have outlived their ritual use are placed. The Sexuality Spectrum is a groundbreaking exploration of diverse sexual orientations through the creativity of fifty international contemporary artists. The exhibition explores a broad range of subjects, including the evolving s ocial and religious attitudes toward sexuality; issues of alienation, marginalization, and inclusion; the impact on the family, child-rearing, and life stages; violence and persecution; AIDS/HIV; and the influence of the LGBTQI community on the Jewish and larger world. This exhibition exemplifies the spirit of the College-Institute’s and the Reform Movement’s commitment to free and open inquiry, inclusivity and outreach, and advocacy on behalf of human rights and the eradication of sexual discrimination. This is indeed groundbreaking! Mazel Tov.